Washington running backs Keith Marshall and Rob Kelley were in the Gamestop store at the Dulles 28 Centre in Virginia on Tuesday. When they saw a kid wearing a Colin Kaepernick jersey then asking how much Xbox One consoles were, the pair got together and bought one for him. The duo were in the store at the same time as 10 year-old Jaden Watts. They first noticed him when they “complimented him on his Colin Kaepernick 49ers jersey”, the Washington Post reports, before approaching the boy’s grandmother to ask if it was OK if they bought him the console and a game. Turned out hey, they were professional football players, and suddenly everyone was cool. Kelley had overheard Watts talking about having to save up to pay for an Xbox, and thinking “I wish someone would’ve done something like that for me when I was growing up”, spoke with Marshall and agreed to buy Jaden an Xbox One and a copy of NBA2K18. 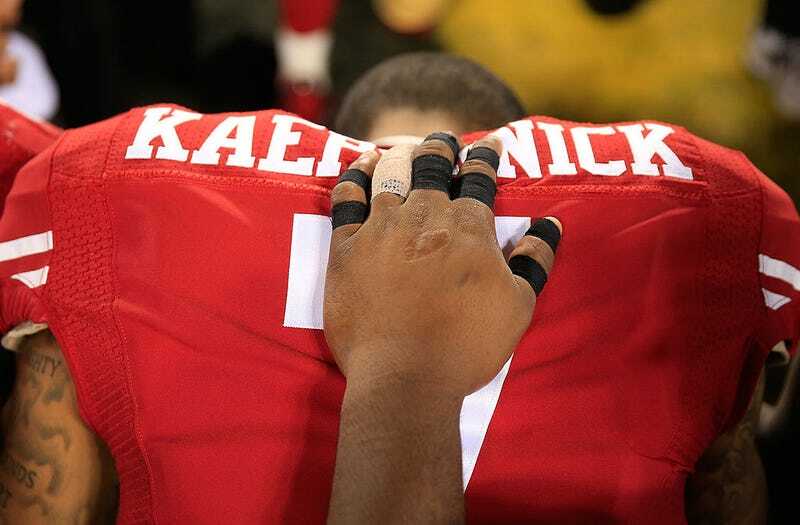 He is now no longer in the league—even though he should be—but the protests he began have continued. This week they exploded into a full-blown crisis for not just the NFL, but America itself after Presidential Twitter Egg Donald Trump waded pork-fistedly into the discussion.